Rely on the Amish Hardwood Medium Podium for all of your public speaking opportunities. 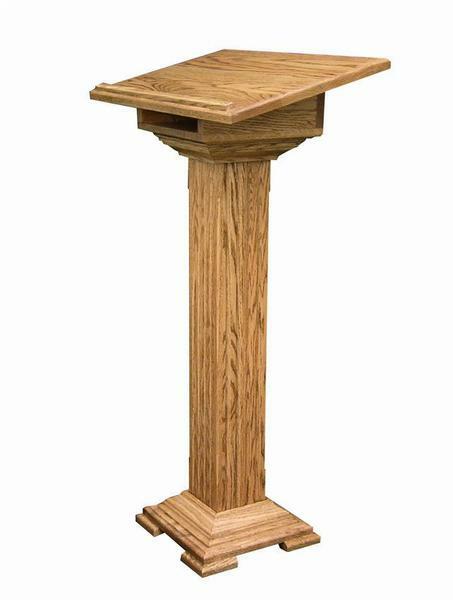 Handcrafted from the finest solid oak around, this standing podium will shine as you present in front of a large crowd or room full of associates. Expertly built to withstand years of use, this podium will assist you during speeches at the start of your career all the way through retirement. Preach sermons and propose ideas with ease by using this easy-to-store podium. Move this solid hardwood, lightweight podium from room-to-room and present wherever you need! Consider a smaller podium for tabletop presentations with our Amish Hardwood Small Cookbook or Bible Stand! Shift from public speaking to looking up recipes and reading your favorite verses with this genuine Shaker miniature podium. Call one of our Amish furniture specialists at 1-866-272-6773 with questions or visit us at our Amish furniture store in Sarasota, Florida to view some of our furniture in person. 24" x 14" x 41.5"